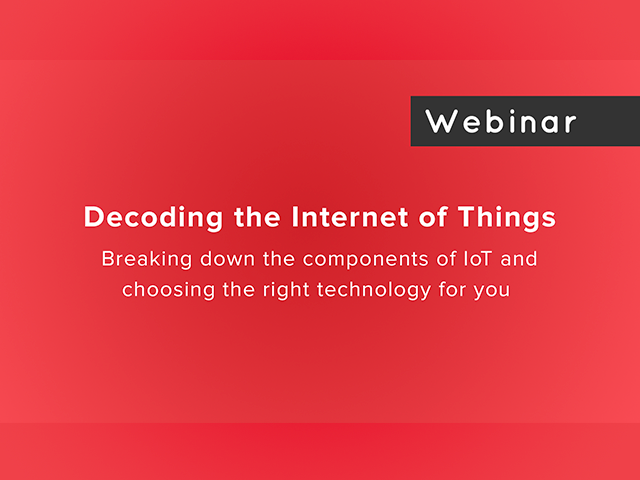 In this webinar, we break down the components of IoT and help you decide on what the right technologies, frameworks, and services are for you. In this 90-minute webinar, you'll discover the vast opportunities made possible by real-time networks that capture, synchronize and persist operational event data in a highly mobile environment. Public transit systems - above all other industry segments - represents one of the most difficult climates for real-time data, analytics, and public safety. Using the most advanced automotive-grade computing and sensor technologies, learn how the coupling of the Internet of Recognition and the Internet of Things with real-time networks provide operational efficiency and unparalleled safety and security for workers and passengers alike. Presented by Bill French - Founder and Chief Analytics Officer, Stream It. The human experience is radically changing, altering the way we interact, collaborate, learn, move, and understand others, the world around us, and ourselves. In this talk, Joe Hanson, Senior Content Manager, PubNub will show you why the human experience has reached this next stage of transformation - due to real-time technology. The real-time technological trend is changing every industry, product, and app out there today, and driving forward the ones of tomorrow. Driven by low-latency, high-reliability connectivity, the real world and the virtual world are merging, and the separation between the two continues to blend more and more. Find out what this means for real-time innovation in this webinar. Type 1 Diabetes is a challenging, life-threatening disease. If you have it, life is fraught with constant monitoring, hundreds of daily decisions to make and the challenge of reconciling short-term health with long-term impacts. Doing this as a parent, with a young child with Type 1 Diabetes, has its own set of similar challenges, with the addition of being pained by the thought of your own child suffering. What does this have to do with PubNub? Well, one of our very own Product Managers is using our platform as a critical component of a real-time solution for helping his family manage this disease. Come learn about how real-time - from messaging to push to history to charting to chat to functions - can be brought to bear to help solve such a personal but mission-critical problem. Jeremy Pollock, Principal Product Manager of the PubNub core platform, will be discussing how he was able to quickly develop a lightweight, easy to maintain and run but powerful solution using PubNub and other open-source, Do-It-Yourself solutions. There are two industries in the world today: those that have been transformed by real-time connections and those that are about to be. Every major technology shift for the last decade has been driven by persistent, consistent, real-time connections: drive-share has eclipsed taxis by instantly connecting riders and drivers; connected exercise machines like Peloton have brought community to home exercise; e-agriculture is boosting yields at rates unimaginable even ten years ago. In this keynote we will examine how the always-on Internet is being replaced by the always-connected Internet; discover technologies that offered early promise and are now evolving into something new and different, with HTTP/2 ready to be the catalyst for the next growth spurt; and outline the new design patterns, combining globally-orchestrated real-time infrastructure with serverless and Edge computing, that will be fundamental to the emerging winners across industries. Serverless has taken the development world by storm. At its core, it’s running application code on servers that are provisioned as-needed by a third party cloud provider. So what’s this mean for your business? In this webinar, we’ll walk through the benefits of turning to serverless technologies for both your engineering team, and your business as a whole. Join this one-on-one discussion with Dave McAllister, Community & Dev Evangelist, Scalyr and Simon Jones, VP Marketing, PubNub for an in-depth discussion on next-generation applications. This interview will be filmed live directly from AWS re:Invent in Las Vegas. Tune in from the comfort of your desk! Join this live panel discussion with experts at AWS re:Invent 2018 for a closer look at multi-cloud management. Innovating and adopting new technologies is key to every business’s success and longevity. But how do you do that without ripping and replacing all your current software with the latest and greatest? Moving from system to system is cumbersome, time consuming, and resource-draining. And once implemented, how do you know the new technology is actually what you need? 1.Increase engagement and improve user experiences, by removing friction from your customer journey with content, data, and information delivery services. 2.Streamline data sources by integrating systems of engagement (touchpoints) with the rest of the business and enterprise architecture. 3.Work more collaboratively with across teams inside business groups and adopt more agile development practices. When building products, it’s not as simple as deciding whether you want to build from scratch, or buy an out-of-the-box solution. With so many services, frameworks, APIs, and solutions available on the market today, the equation of how much you want to build, and how much you want to buy, can be difficult to solve. In this webinar, we’ll lay down the landscape for build vs. buy in 2018. We’ll show you the benefits of both hosted and open source solutions, and when it’s best to choose each. From security, to time to market, to reliability, build vs. buy can make or break your product. This is a webinar you don’t want to miss. The most commercially successful multiplayer titles all deliver fast, reliable ways to communicate. Unfortunately, most game developers don’t have the budget of EA to deliver it. So how do you do it? In this webinar, we’ll walk through best practices and design patterns for building text chat into your multiplayer game, including infrastructure, user management, and how it works with your existing game servers. Extending chat to mobile customers is one of the hottest topics in mobile engagement. With mobile devices playing an increasingly important role in both e-commerce and in-store spending, connecting with customers wherever they are has become more important than ever. And just as live chat has become a critical part of customer engagement on your website, it’s just as important on your mobile site and mobile app! The shift from desktop to mobile among online consumers is incontrovertible and is accelerating in a variety of ways, including mobile commerce volume, research of products and services, and expectations of service levels. Professionals in e-commerce, marketing, customer service, and customer experience are aggressively deploying strategies to meet customers where they are and to deliver the services and experiences customers want and expect. Live chat has become an expected service on traditional websites and now has the highest customer service rating among online service channels (Forrester, 2017). Live chat on mobile is now expected to standard. Your selection of a great mobile chat solution can have important and enduring implications for your business, and careful consideration of your options is imperative. In this webinar, we’ll be going over the TOP 8 things to considering as you think about Chat and Mobile. For the modern business - time is everything, and every millisecond counts. In fact, time is the #1 asset to any business. In this webinar, we’ll show you why time is so important and how to best utilize the small window you have. *Learn about information decay, and why it’s accelerating. *What information decay means for your business, and why managing time is imperative to a modern business’s success. *What technologies and services can be used to take advantage of small amounts of time. What is serverless compute, and why is it taking the world by storm? Why would you need PubNub Functions, and when would you use it? And how can you best utilize Functions to deliver the exact feature or functionality on your roadmap? These questions will be answered in our upcoming Crash Course in PubNub Functions led by Adam Bavosa of our Dev Rel team. He'll take a deep dive into the technology, break down the different components, and show you how you can build serverless compute into your application today. *Operalization - monitoring and testing Functions - best practices for deploying your Functions (especially important to apps in production). Cognitive services have hit the mainstream. Delivered through powerful, easy-to-use APIs, businesses can harness the power of artificial intelligence and machine learning and integrate them directly into their applications. With Microsoft’s exciting release of Translator v3, we just announced our Translator BLOCK - bringing the power of the Microsoft AI platform to PubNub. Using the BLOCK, you can now quickly and accurately translate natural text and speech into a number of different languages with no additional servers or logic required. With Functions, all language translation takes place in the network. In this webinar, we’ll introduce you to the new BLOCK, and show you how easy it is to implement powerful translation capabilities into your realtime app. -Dockerizing application code and microservices ... and so much more! Join us Tuesday, July 10th, at 10am as the PubNub DevRel Team shows you how to BYPASS ALL THESE STEPS and build a faster, infinitely scalable, and totally secure REST API in just a few minutes using PubNub Functions. By 2020, it’s predicted there will be over 21 billion connected devices deployed across the Earth. From leading smart home technology like Echo and Google Home, to connected fitness like Peloton, to next-generation connected car and mass transportation, IoT devices continue to impact our lives at a deeper and deeper level. Join us as we explore what’s to come for IoT. PubNub Developer Relations Manager Jordan Scheutz will walk through how IoT devices are evolving in the current market space, and why keeping those devices secure is paramount. And in a hands-on approach, he’ll also demonstrate how accessible this technology is to makers and builders - showcasing the power of Arduino microcontrollers for smart home devices. Event-driven architecture isn’t new, but recently it’s taken the software development world by storm. With more devices creating more data, and the rise of edge computing and loosely-coupled apps, doing more with the data in less time has opened up the doors for the next-generation of IoT deployments. The Internet of Things continues to exponentially increase in adoption - from home automation, to eCommerce, to connected cars, to industry and agriculture. No matter where smart devices are deployed, event-driven architecture expands the capabilities and performance. In this webinar, we’ll introduce you to event-driven architecture for the Internet of Things, discuss use cases where EDA has already been implemented today and what the future holds for EDA and IoT. Software components frequently authenticate their identity in order to talk to other components using API credentials and username/password pairs. It's imperative that this type of critical information is kept safe from prying eyes. Functions Vault addresses this security issue and allows users to store their secrets in an encrypted fashion only to be decrypted when they need to be used. This Webinar dives into details on how developers can apply predictive maintenance to devices connected to the PubNub Data Stream Network (DSN). It will explore the concepts of the recently announced PubNub support for MQTT, along with Functions, as well as how to integrate with 3rd party cloud services such as Microsoft Azure. Mapping and charting your data streams doesn’t have to be difficult. In fact, with our latest integrations with Microsoft Power BI, you can get realtime dashboards up and running in minutes. Join the PubNub team and Microsoft Senior Program Manager, Sirui Sun, as they dive into the various Power BI connectors with PubNub - including the new Power BI Block available in the PubNub Blocks Catalog. PubNub is the best way to build and scale real-time applications like chat, consumer IoT, and real-time mapping. Build quickly with pre-built SDKs, integrations, and serverless computing at the edge; then scale on a global network that delivers any message in under a quarter of a second with five 9’s reliability guaranteed.